"Chocolate pecan pie that you can eat with your hands." In a medium bowl, cream together the butter and confectioners' sugar until smooth. Combine the flour and cocoa; stir in to the creamed mixture. Bake for 12 minutes in the preheated oven. In a small bowl, stir together the egg, sweetened condensed milk and pecans. Pour over the prepared crust. Bake for an additional 20 minutes in the preheated oven, until set and lightly browned. Cool in pan before cutting into bars. This was easy to make and people at the office enjoyed it. Not too sweet but just right, more like a brownie with a layer of crunchy sweet pecans on top. I was disappointed. The bottom crust was way too dry. 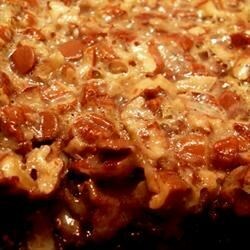 This was easy and good, but not as good as other pecan pie bars I've tried. Fantastic recipe! I add a dash of cinnamon to the bottom and some bourbon and powdered tahitian vanilla to the top. Yummy. Really easy to make (maybe easier than my favourite fudge brownie recipe), tastes like a pie! I used 4/5 of quantity of pecans suggested by recipe, and added milk chocolate chips. Great! No changes. Let the top brown and the bars came out really dry. I wanted to make chocolate pecan pie as finger food for a party, but I was disappointed. Not sure I'll make it again.